In our home office I have a file labeled “Lifetime Warranty.” Believe it or not, you probably have a bunch of things with lifetime warranties. But, try collecting on the item’s failure without a receipt! Many companies who offer lifetime warranties are counting on consumers to fail to keep up with them. 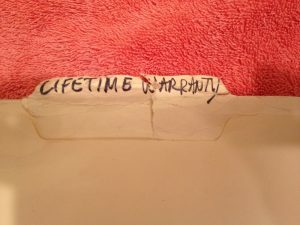 A folder labeled “LIFETIME WARRANTY” holds valuable proof-of-purchase of items whose warranties never expire. For example, the treated-lumber boards on a fence at our office rotted. 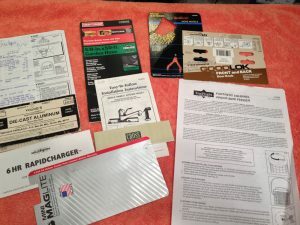 Most of the boards still had the familiar yellow tag on one end, which I thought would serve as “proof of purchase”and represent a valid claim to the lifetime guarantee. Not so. The company actually paid a lawyer to deny my claim in writing, referring to the clause in the guarantee that requires the original receipt. For what they paid that attorney they probably could have bought me the few boards I was asking to have replaced! Get a load of the variety of items with never-ending warranties. Another advantage of this file is that it tickles the memory about what has a non-expiring warranty. Craftsman lifetime warranties don’t require a receipt, under normal circumstances. 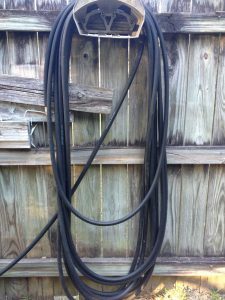 However, I once took a 100-foot garden hose in for replacement. I’d had it nearly forever, but, lifetime is, well, lifetime. There would have been no problem, except that when this hose was made, the only place that said “Craftsman” was on the female end of the hose. You’re getting ahead of me, but, yes, that was where the defect was. The part that housed the female threads had been separated from the ferrule, and the only Craftsman insignia was on that part. In spite of all the money I’ve spent with Sears and the Randolph generations before me who lived by the saying, “If Sears ain’t got it, we don’t need it,” they wouldn’t take my word that it was a Craftsman hose unless I had a receipt. Stubborn man that I am, I took my hose back to work and sulked. The next day I was off to Sears, 100-foot hose in the back of the truck, female hose threads deep in my pocket. I had wire-brushed the tarnish from one facet so that “CRAFTSMAN” gleamed for everyone to see. I called the Sears personnel together who had doubted my veracity a few weeks before, produced the required proof, and was awarded my brand-new hose. If the lawnmower ever chops this hose, there will be no problem collecting the Craftsman lifetime warranty, the print will be on every piece of hose! Some other time, remind me to tell you how I got lifetime-warranty batteries from J. C. Penny Automotive for nearly 25 years. Yep, those receipts are worth keeping.